Get a pretty pout in merely minutes. Lips that are pouty and full are often considered to be desirable and sultry. Hollywood stars such as Scarlett Johansson, Jessica Alba and Angelina Jolie have in recent years contributed to the fascination with full lips. If you were not born with lips that are naturally look plump and full, do not fret. Simple makeup application tips and trickery can help to give your lips a soft and pillowy appearance in just a few minutes. Use lip gloss. Sheer lip gloss can help provide the impression that your lips are fuller. Simply apply a small dab of sheer gloss in the middle of both your lower and upper lips. Complete the look with a light brushing of tan eyeshadow on the outer portions of your top lip. Try a lip pencil. One technique for full lips involves using a pencil for contouring the central portions of your lower and upper lips alike. Then, to get a fleshy and juicy full lips look, dot on your lipstick softly. Smooth down your lipstick using your fingers. To complete the look, apply a light coating of gloss. Increase the size of your lips using lip liner. 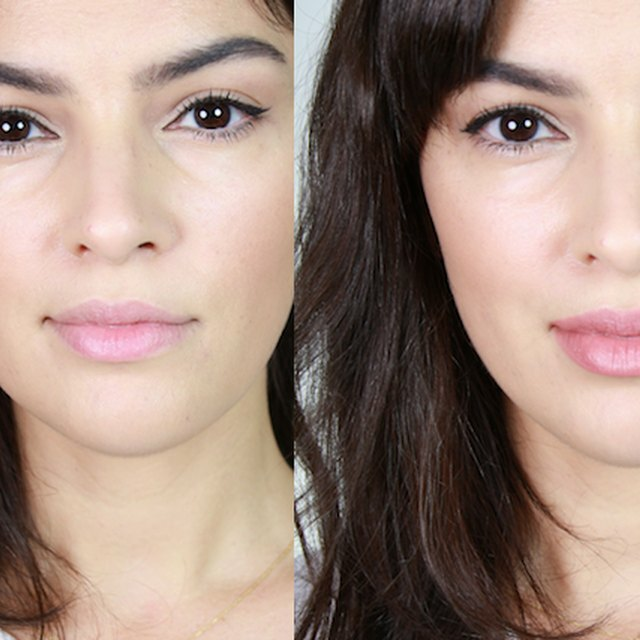 To get dramatically larger looking lips, use lip liner to create an outline just outside of your normal lip line. If you are unable to draw a line that looks steady or natural, instead try to dot the line on. Then, use a lip brush to apply your lipstick. To attain an even and natural look, repeatedly purse your lips together for a couple of minutes or so. Add a little plumpness with an eye pencil. Make sure the eye pencil is in a light and luminous color. To give your lips a soft and juicy look, use an eye pencil on the double curve of your top lip. Seek out an extended-wear pencil that will not fade quickly. Follow your upper lip curve with an eye pencil and then finish off the look with your lipstick. To bring out the fuller style, apply a lipstick that has a muted color, such as light pink or beige. A variety of makeup brands (such as City Cosmetics, N.V. Perricone, LipFusion and Isadora) produce lip glosses that are specifically intended to temporarily give the lips a fuller appearance. The active ingredient of these glosses is collagen, which plumps up the lips through a rehydration and swelling process. Before use, consult with your doctor regarding the safety of these lip plumping products.